Peace and tranquillity, in a secluded valley yet within minutes of restaurants, a medieval village and the shops. Everything you could hope for from a traditional Umbrian farm house, combined with everything you would dream of in contemporary living. A thirteen meter swimming pool looks out over sunflower fields and olive groves to the mountains of the Marche in the distance. The pool is fenced for your children's safety. Combined with an adventure playground, home cinema, broadband internet it's the perfect family holiday destination. The house has 5 bedrooms and 3 shower/bathrooms. A large 49 square meter barrel vaulted sitting room with grand piano and French doors to the garden. A real chef's kitchen with 5 burner Smeg, twin fridges, multitude of appliances, pasta maker, Magimix, microwave, blender, wok, masses of pots pans and kitchen utensils. The house is set in a hectare of land with walnut, olive and fruit trees providing plenty of shade from the Umbrian sun. A small river runs through the valley which is brimming with wildlife, birds, butterflies and even the odd porcupine. We bought and restored the house in 2000. I write music for a living and have frequently used the house as a base for work - hence the grand piano! My wife used to run a fresh organic baby food company so the kitchen won't disappoint anyone who loves to cook. The local community is wonderfully supportive and filled with character and characters. You won't forget a holiday here. Once you see where it is it will be obvious why we chose this one. The combination of rural peace and tranquility, you can hardly see another house, the deep dark of the night and the proximity to the most wonderful medieval village was a real winner. Each bedroom has an individual air conditioning unit. We have a large fireplace in the smaller of the two sitting rooms and a very large wood burner in the main sitting room. We have two internet connections ADSL which is unlimited but also unreliable and satellite which is reliable but bandwidth limited satellite - there's a max 1gb download allowance per day. Two sitting rooms on the ground floor and a small sitting area on the first floor. Smeg 5 burner oven Twin fridges Magimix, microwave, pasta maker, wok, enormous range of pots and pans, knives and cooking utensils. Dishwasher and washing machine. We have satellite TV via the Astra 19.2E satellite which provides a wide range of free to air programming in many languages. Includes some English channels including Sky News and CNN. Dozens of DVD's and blue ray disks - plenty like the 20 DVD Peppa Pig boxed set (!) aimed at small children who sometimes need to relax in the cool indoors during the heat of the day. 1 hectare of grounds, with large areas of lawn. Many trees provide a wealth of shady spots to relax. There is a large loggia with the BBQ and seating area, ideal for early evening drinks watching the sun setting. Tennis is available at the local sports centre 10 minutes away. The courts are great on the top of a hill with stunning views over the medieval village. 13 meter pool overlooking the Umbrian countryside. Sun beds are provided for 10 people. Then pool is down a short flight of steps about 50 meters from the house. The pool is fenced. We aim for a Saturday change over day but we are flexible and don't specify that in the booking details. When we're really busy in the high season in particular we always change over at weekends but if you have any queries, just ask! For a party of 9 (4 adults and 5 kids) we found the space both inside and outside superb. The local medieval towns and villages provided all we needed for supplies whilst Terni train station (10 mins from villa) gave us an easy 50 minute train ride into Rome. The internals of the property were good. The kitchen large and ample enough to cook for 9 with the loggia having seats and dining for easily over 10. We ate outside every evening. It is worth noting that the kitchen was well appointed with large cooker, two fridge freezers (food & wine), more pots, plates and cups than a professional cooks kitchen and a really useful central island. The pool was excellent but also a little disappointing too. The tiling round the pool needs urgent attention. With cracks and lifted tiles it was at times unsafe and gave for precarious steps being taken. The owner was aware of the need to fix and I do expect this would be resolved to the same good standards as shown elsewhere. The actual pool was amazing and never below 27 degrees and caught the sun all day. The views were also great and was a lovely spot to soak up the sun and drink a wine or two! The wildlife was abundant; lizards, small frogs, foxes, and yes mosquitos. There were some local dogs which visited the villa at times looking for food and even took to sleeping under the loggia at night. These never posed a real issue other than the occasional barking at night which did disturb some of the party. There were masses of things for us and the kids to do. The star gazing with the telescope was amazing, table tennis awesome, badminton great fun, loads of board games, DVDs, books and more. Overall we would certainly recommend for a large family this property. We also would return if we didn't enjoy choosing different villas each year. It was a great holiday in a great location. We had a great two weeks in this villa - loads of space inside and a wonderful pool. It's a great "get away from it all" villa if you want peace and quiet, but it's still only about 10 minutes drive to the town and several restaurants if you want to go out.... Very helpful owners just a text away if needed. Highly recommended! Wish I Could Keep To Myself!!!!!! I would love to keep Casanova and San Gemini all to myself however it is just to special not to share! Emma was a delight to work with, very quick to respond from my initial contact through our stay and even after departure. The house and setting are BEAUTIFUL! You will have everything you need. Kitchen is awesome, more room than you will know what to do with, pool, washer, dish washer etc..... etc..... There is tons of info on Italy, Umbria and the local area. This was our first visit to Italy and our expectations were exceeded! My family and I enjoyed a fun and relaxing week in Umbria at this beautiful country house. The interior was spacious and well stocked with everything you'd need for a relaxing holiday. The two toddlers were well provided for as well, which saved us bringing a lot of additional luggage. The exterior was beautiful. A well maintained pool, play area and outdoor eating space kept us all entertained. Emma was quick to respond to our little queries and questions. This is a great find. I wouldn't hesitate to recommend this to others. Secluded large family house, Relaxing loggia, wonderful pool, fascinating nature, lovely open views. Casanova, a wonderful house to relax in and step away from the hectic pace of life in London. It is a real home from home. The owner Emma is so very helpful - nothing was too much trouble and she responded quickly to any queries we had. She and Guy have really thought of everything at Casanova so we could relax fully on holiday! We appreciated the well equipped kitchen, a drinks fridge for the hot weather, the large loggia with pretty lights strung up for the evening, a huge table for eating outside which we loved. We enjoyed family games nights in and out. We spent many days in the large pool complete with a selection of inflatables which were provided. We had wacky races in the pool, handstand and diving competitions with our 3,6,9,12 and 15 year old. We had table football tournaments many evenings,and my dad and I enjoyed the grand piano too. The boys played basketball and if it had been cooler would have used the bikes. There are colourful sunflower fields and olive trees all around. There are great places to eat just a 5-10 min drive away. The beds in the rooms are comfortable, the bedding pretty, the showers were powerful too! We had many fascinating encounters with nature in the garden: holding a baby lizard which we found near the pool, pretty butterflies, a toad, a giant grass hopper, swallows, baby ladybirds, waking to the sound of birdsong, an abundance of fireflies which delighted us in the evenings, beautiful clear nights and thousands of stars to behold. There a several good places to eat nearby, a smaller supermarket 10 mins away, and the very interesting Cospea supermarket in Terni. From San Gemini, we visited many interesting places too. Our favourites were Narni from which CS Lewis named Narnia, the beautiful town of Spoleto, amazing Roman ruins at Carsulae, Orvieto, 2 very doable day trips to Rome by train from Orte, a water park south of lake Trasimeno, the Marmore falls, Assisi. We spent three memorable, fun and relaxing weeks at Casanova. 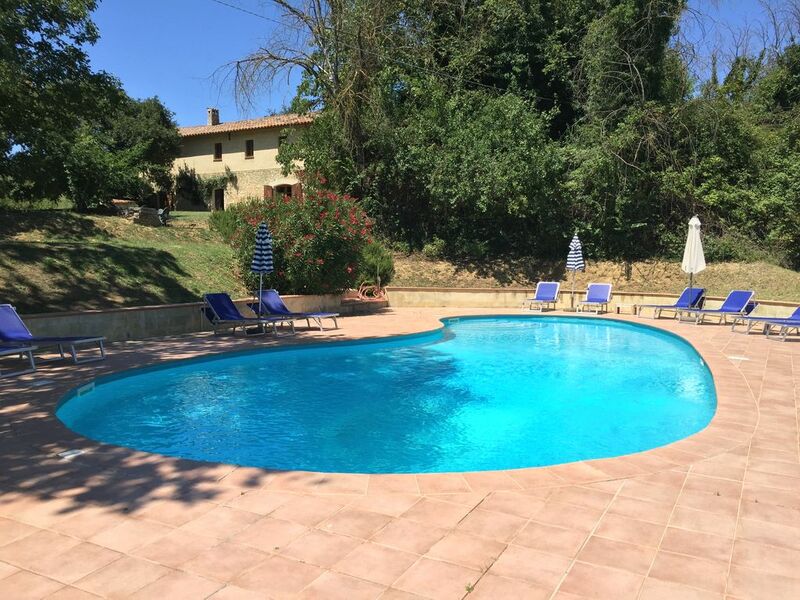 This is a perfect family holiday retreat if you want to get away from it all and experience the real Umbria. Selfishly, I would love Casanova to remain a well kept secret but it is a place to be shared. We would have happily spent another 3 weeks here! We will certainly return. Meget rummelig bolig i smukke omgivelser. Fredeligt og roligt midt i naturen men stadig tæt på en lille by, San Gemini. Lækkert poolområde og skøn terrasse med plads til den store familie. enjoyed your holiday at our house. Ski: Rieti, just 45 mins from the house, is the favoured ski resort of Romes winter sports fans.